Ayatollah Khatami, part of elite council that elects Supreme Leader, claims US created ISIS and will sanction Iran's human rights abuses. In yet another indication of the open hostility still felt in Iran despite the recent nuclear deal with world powers, a leading Muslim cleric in the Islamic regime came out on Thursday calling the US "the enemy of Islam." 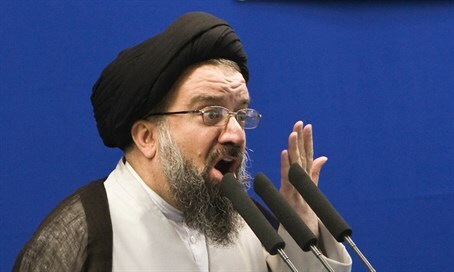 Ayatollah Seyed Ahmad Khatami made the comments in a speech at Tehran University campus for Eid al-Adha prayers, as reported by the semi-official Fars News Agency. Khatami is the provisional Friday Prayers Leader, and is a member of the elite Assembly of Experts that elects and removes the Supreme Leader of Iran, and also is tasked with supervising what he does. Back in 2012 he said Iran is already a nuclear state, and last May he called to punch US President Barack Obama in the mouth. According to the senior cleric, the nuclear deal has done nothing to reduce the enmity between the leading state sponsor of terror and the United States. "The US wants to induce that the ices of relations have melted while this is not true," said Khatami. Sharpening his tone further, he said "the US is the enemy of Islam for its support for the butcher and usurper Zionist regime, creating terrorist groups, including ISIS (Islamic State), and supporting the crimes in Yemen, Bahrain and Syria." Khatami also claimed that after sanctions are removed in the nuclear deal, the US will seek to impose sanctions on Iran for its egregious human rights abuses. However, US Secretary of State John Kerry has told senators that Congress won't be able to impose new sanctions on Iran, whether nuclear in nature or not, so as not to appear to show "bad faith" to the deal causing Iran to breach it.